And my next novel has a cover! 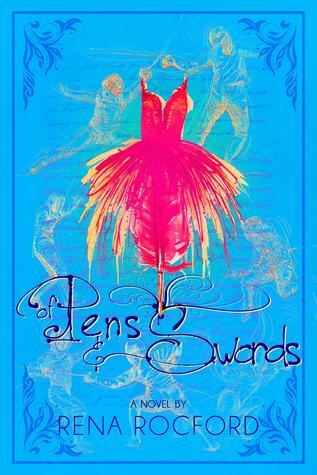 That's right, my next novel, Of Pens and Swords has a cover! I LOVE my cover. I love that it's different from the cover of my first book because they are very different novels! Seventeen-year-old Cyra Berque wants two things in life: a date with Rochan and a chance to show the world a one-handed girl can fence in the Olympics. When Cyra’s coach tells her he’s taught her everything he can, he sets her up with another coach, one who could take her all the way to the top, but the new coach costs more. Feeling her dreams slipping out of reach, Cyra agrees to tutor a ballerina with a rich father and a D minus in English. He’ll pay Cyra three times her usual tutor rate if she can get his precious daughter to a passing grade. The ballerina only has eyes for Rochan, and she’s promised Cyra to turn her D into a full fledged F if Cyra doesn’t help her win the heart of Rochan. You can add Of Pens and Swords on Goodreads! Labels: Cover Reveal, I LOVE COVERS!, OMG I HAVE A COVER!!!! Another awesome cover! You're on a roll lady! It's all my publisher at this point! They rock at the cover thing, so I'm super excited. Okay, I love the colors and the font! And I just now realized that the dress is also a quill! SO COOL! I saw a version where they had my name in the same font as the title. I'm thinking about buying it from the cover artist to have that as the font for my business cards! I like the conflicts of the story. Seems like one of the characters is going to lose out. Hope it's not Cyra. Tee hee! I cannot say a word on the outcome, but some choices are harder than other others! Ohmygosh! I not only love the cover, I love the plot, too. I agree with Ken. I hope Cyra comes out on top. I've enjoyed the recent blog hop and connecting with bloggers online. All the best with this new book. I'm glad you enjoyed the blog hop! It was great fun! Ooh, I love the blue, and I love the images in the cover, too! The premise sounds neat, with a lot of tough decisions, I'd imagine. Congrats! Oh, yes, lots of tough choices ahead with this novel! Very cool cover! It's so interesting! It has a lot of really neat elements. I keep finding cool things I hadn't noticed before.